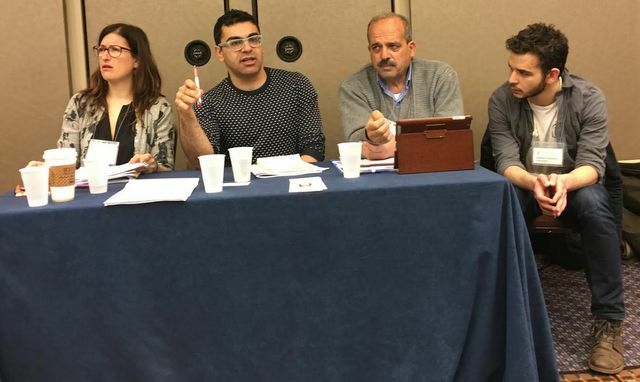 Manawel Abdel-Al, of the Palestinian General Federation of Trade Unions (third from left) speaks at 2016 Labor Notes conference. As reported below, trade union solidarity with Palestine continues to grow. 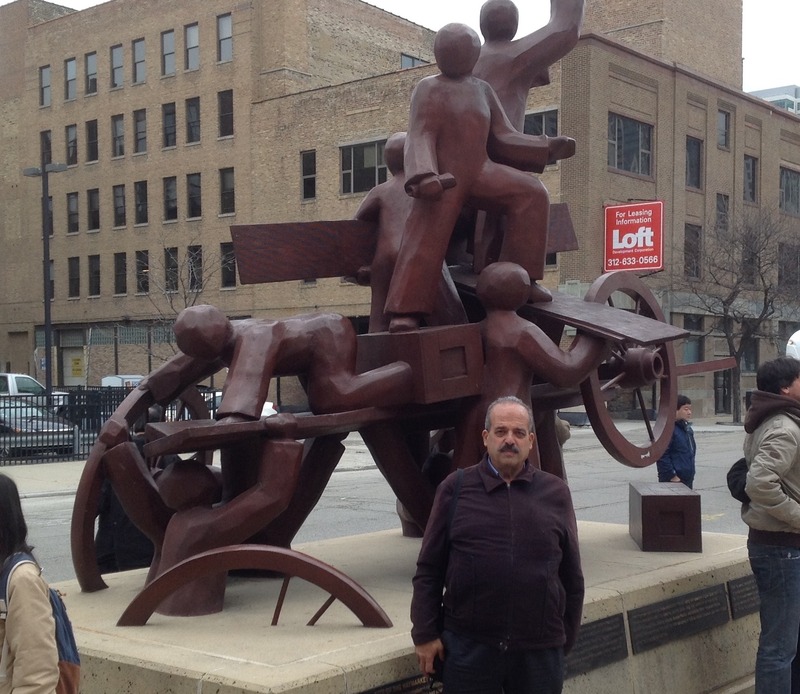 In two well-attended sessions at the 2016 Labor Notes conference in Chicago, Manawel Abdel-Al, of the Palestinian General Federation of Trade Unions, explained the condition of Palestinian workers (including the recent West Bank teachers’ strike), and his personal support for one democratic state with equal rights for all throughout historic Palestine, coupled with refugees’ full right of return. He also discussed the need for solidarity with the Boycott, Divestment, and Sanctions (BDS) movement. This was followed by discussion of recent BDS work in North America, including Labor for Palestine (LFP) campaigns; ILWU Local 10 members’ refusal to handle Israeli Zim Line cargo; and historic BDS resolutions from UAW 2865, CNS (Quebec), United Electrical Workers, and Connecticut AFL-CIO. An LFP delegation has just returned from Palestine, a report of which is forthcoming. This Saturday, April 16, LFP and other BDS supporters will be speaking at a Jobs With Justice conference in Springfield, MA. *Read and distribute Labor for Palestine: Challenging US Labor Zionism (American Quarterly, December 2015), which provides historic and current overview. *Tell us how we can support efforts to organize LFP meetings, chapters, resolutions, and/or other events in your local area. 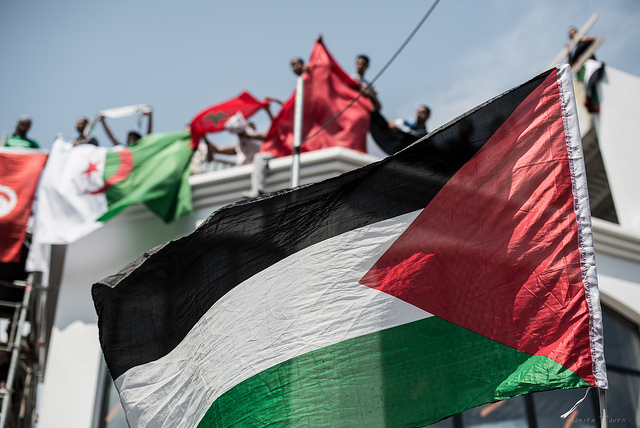 *Let us know if you are interested in joining a future LFP delegation to Palestine. *Like the LFP Facebook page. *Donate to Labor for Palestine, which has been at the forefront of U.S. labor BDS since 2004. Jeff Schuhrke is a Summer 2013 editorial intern at In These Times.